GAP Waiver provides supplemental protection to a borrower’s primary insurance and is designed to help borrowers avoid financial loss in the event of total loss or unrecovered theft. The difference between the loan/lease net payoff amount and the actual cash value (ACV) paid by the primary insurance settlement produces a deficiency balance or “gap.” This remaining loan/lease balance is covered (or waived) with GAP protection. Golden Eagle Insurance provides GAP coverage through only through lenders. Another borrower benefits from the power of GAP! 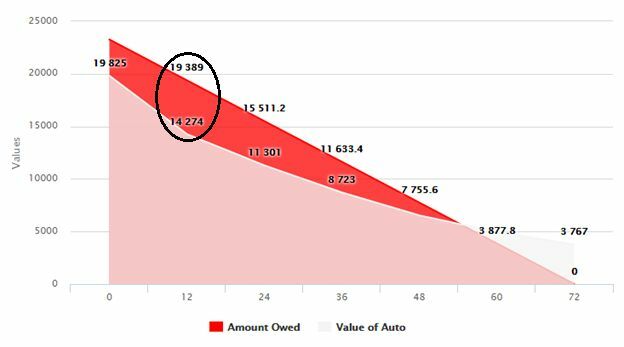 Check out the details from a recently paid GAP claim: A borrower recently experienced a total loss of their vehicle. Without GAP coverage the borrower would have a been hit with a heavy out of pocket loss, depleting savings or even causing credit problems. There was a deficiency balance between the amount the primary insurance paid and the remaining balance of the loan that was PAID using Golden Eagle Insurance GAP! Thus, the borrower and the lender were protected. At the time of sale, the below GAP graph indicated there would be a deficiency balance during this specified time period of the loan. The borrower purchased a GAP waiver and filed a claim after 12 months. There are more vehicles on the road with negative equity than ever before due to factors, such as longer loan terms and rising depreciation. Showing borrowers the GAP graph can help illustrate the importance of purchasing GAP to reduce the risk of a negative equity situation. Encouraging your borrowers to purchase GAP waiver can turn a stressful and negative situation into another success story like this one!